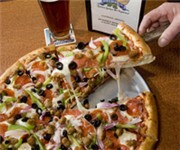 Sports bar, restaurant, and brewpub serving pizza and pastas, with locations throughout San Diego County. 6 Comments about Oggi's Pizza and Brewing Co.
How Would You Rate Oggi's Pizza and Brewing Co.? Breweries near Oggi's Pizza and Brewing Co.